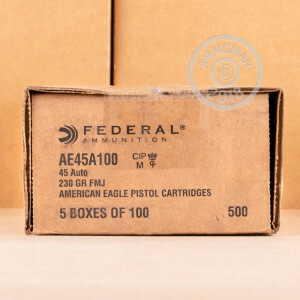 Bulk boxes of Federal American Eagle range ammo are a great way to keep your skills sharp without busting your budget. This box of loose packed rounds is a great deal for owners of 1911s and other .45 ACP pistols. These cartridges fire a simple standard weight 230 grain full metal jacket bullet at a muzzle velocity of about 890 feet per second. Each round in this box of 100 uses non-corrosive Boxer primers and brass cases. 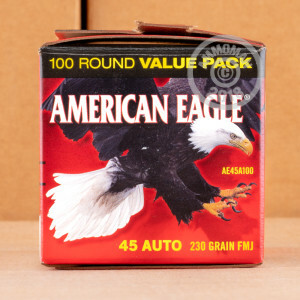 AmmoMan.com is a great place to pick up a big pile of ammo for your next shooting season. We offer free shipping on all orders over $99 to save you money and time. This ammo worked perfectly and had no problems. Ammo was clean also. Will purchase again and purchase from ammoman! I haven't shot these just yet, but my order arrived within 2 days of me placing it. Very impressed with ammoman prices and shipping so far!!! Good price and ammo. Will buy from Ammoman again. He hasn't fired any round yet, but is very happy with his new ammo. All around great experience. Love theftee shipping! Everything about this transaction was easy and went well. 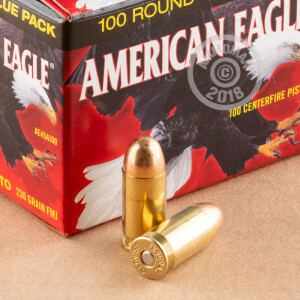 American Eagle is great ammunition at a reasonable price.